As a parent - what can I do? Your doctor will be able to confirm wether your child has CMA. In preparation for your visit, prepare yourself so you can ask the right questions. Information about your child's symptoms will definitely be helpful. Your child has been diagnosed with Cow’s Milk Allergy – what can you do now? Children require a certain amount of daily protein to grow and develop normally, so you will have to find a substitute for cow's milk proteins. When diagnosed, what dietary products could your HCP recommend for your child? Products in the Neocate range are used under medical supervision and the advice of a healthcare professional. Does your baby suffer from a food allergy? Neocate is intended for the nutritional management of cow's milk allergy and other indications where an elemental diet is recommended and should be used under the direction of a healthcare professional. 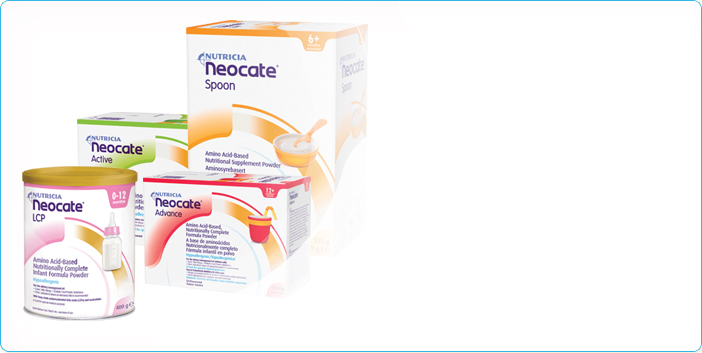 Neocate must be used under medical supervision after full consideration of all the feeding options, including breastmilk.